What is a Seized Platter Motor? One of the more common problems a hard drive can be subjected to is a seized platter motor. On the application of power the drive does not spin-up. 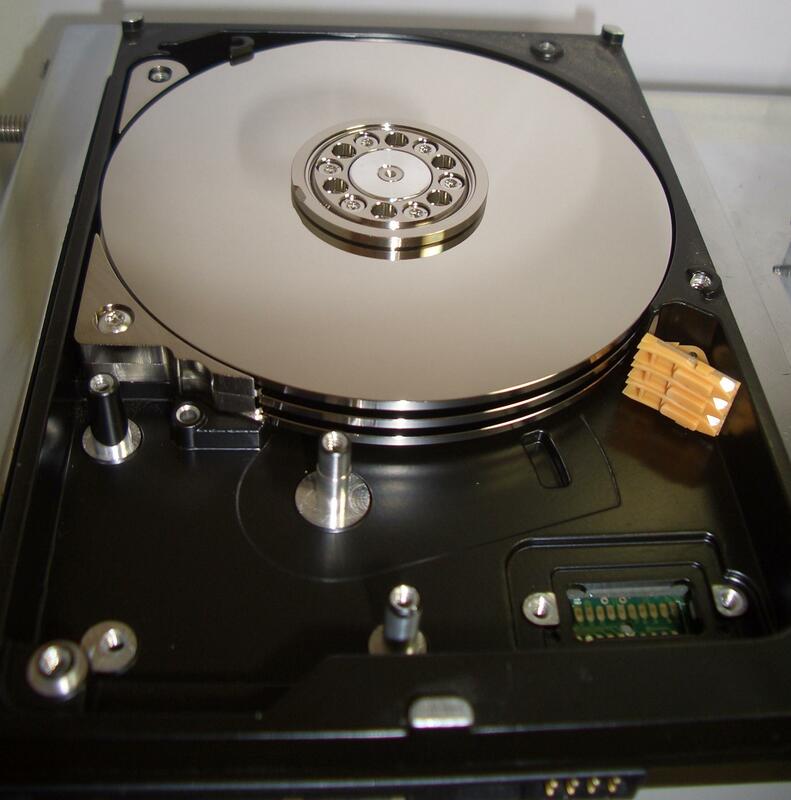 The platters within the hard drive do not spin and consequently of course there is no access to any of the data on the drive. For a quick hard drive anatomy lesson have a look at this article. In a healthy hard drive the motor on which the platter(s) inside the hard drive sit will spin-up shortly after power is applied. If that motor has become seized then typically you will feel a short pulse every second or so as the drive attempts, but fails, to spin. There are some examples of what this can sound like here. What Causes a Platter Motor to Become Seized? The first point to note is that just because the drive does not spin-up when power is applied doesn’t necessarily mean that the motor is seized, there are many other possibilities (as discussed on this page). 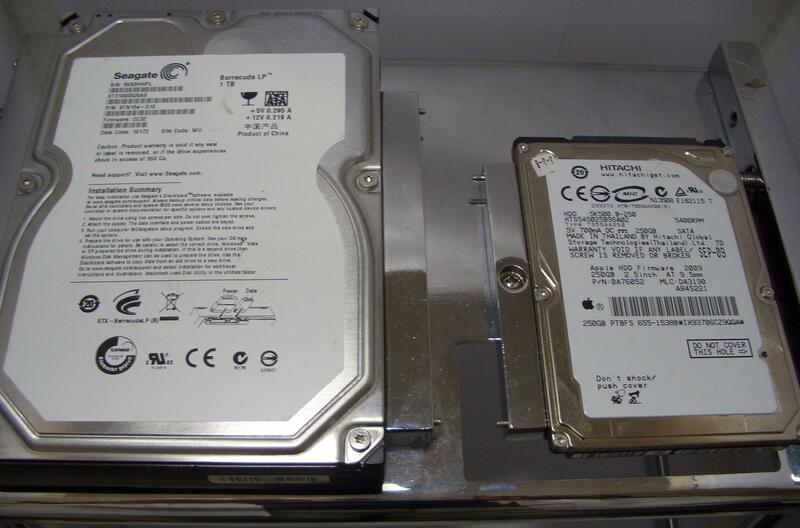 The drive on the left is a 3.5″ (or desktop) sized, the one on the right is a 2.5″ (or laptop) drive. -Easily the most common cause of a seized motor is the drive being physically dropped. It is very unusual for a drive which was fitted in a desktop computer to fail in this way but it is common for a portable external drive. People are always amazed at how small an impact is required to cause this. A drive falling onto its side (as opposed to a drop from height) can and occasionally will seize the platter motor. -3.5” drives are much, much more likely to suffer a seized platter motor than a 2.5” drive. In fact, while not unheard of, a 2.5” hard drive with a seized platter motor is a genuine rarity. In the case of these smaller drives the problem is much more likely to be elsewhere. What can be Done to Regain Access to a Drive with a Seized Platter Motor? The first point to make is that there are no unskilled do-it-yourself options. This work is challenging to the experts, even with their specialist equipment and experience. The only way forward is to replace the motor itself with an identical one from a closely matching donor drive. This procedure is usually referred to as a platter-swap. The view when the hard drive lid is removed. Step one is safely to remove the read /write head assembly, the associated magnets and the printed circuit board, leaving just the platters sitting on the seized motor. The donor drive must be similarly prepared as the platters will now be moved from the failed drive to the donor. This is an extra-ordinarily delicate procedure, not only must the platter surfaces never be touched but the relative rotational position of the platters must be maintained. 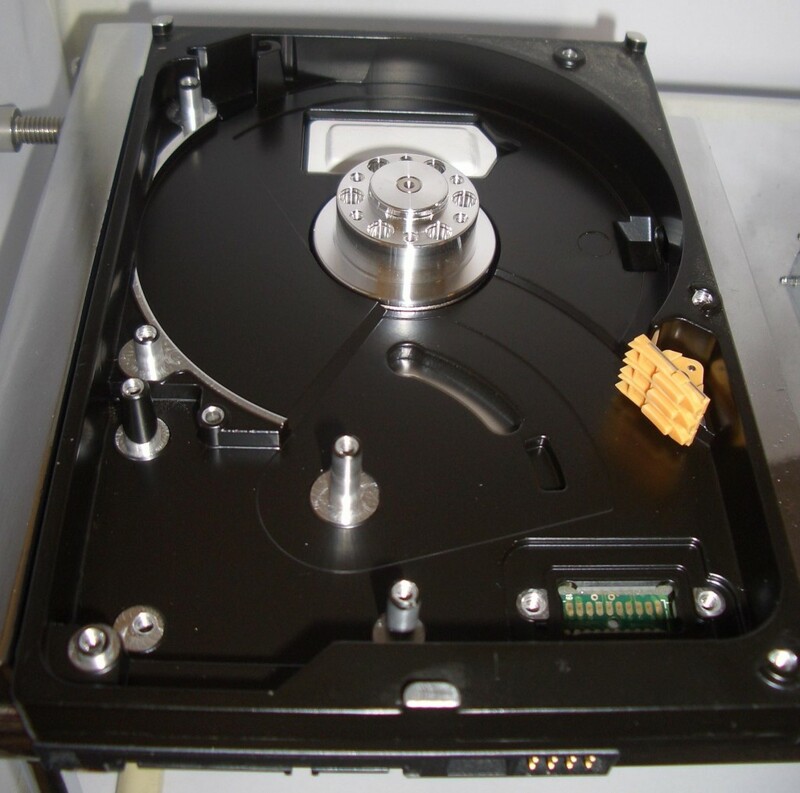 The relative alignment of the platters within the drive is critical, should the platters rotate to even the smallest degree with respect to each other then all data would instantly be lost, files are written across the multiple platter surfaces (as opposed to filling one surface and then moving onto the next). In other words a file may be stored in part on the uppermost platter surface and in part on the one below. Once the platters have been successfully transferred to the donor chassis the original head-magnets, head assembly and PCB can then be fitted to the donor chassis. We now have a hybrid drive. If access can be regained on subsequent power-up then the drive must immediately be cloned to a healthy target drive. This target drive can then be scanned and the vital user data extracted. In many cases the read /write heads will also have to be replaced with those of the donor. Commonly the impact which caused the platter motor to seize will also have thrown the heads against the platter surfaces damaging them. The biggest problem and most likely reason that the platter swap could be unsuccessful is that the impact suffered by the drive caused the heads physically to impact and scratch the platter surfaces. Where this has happened the chances for recovery are greatly reduced. 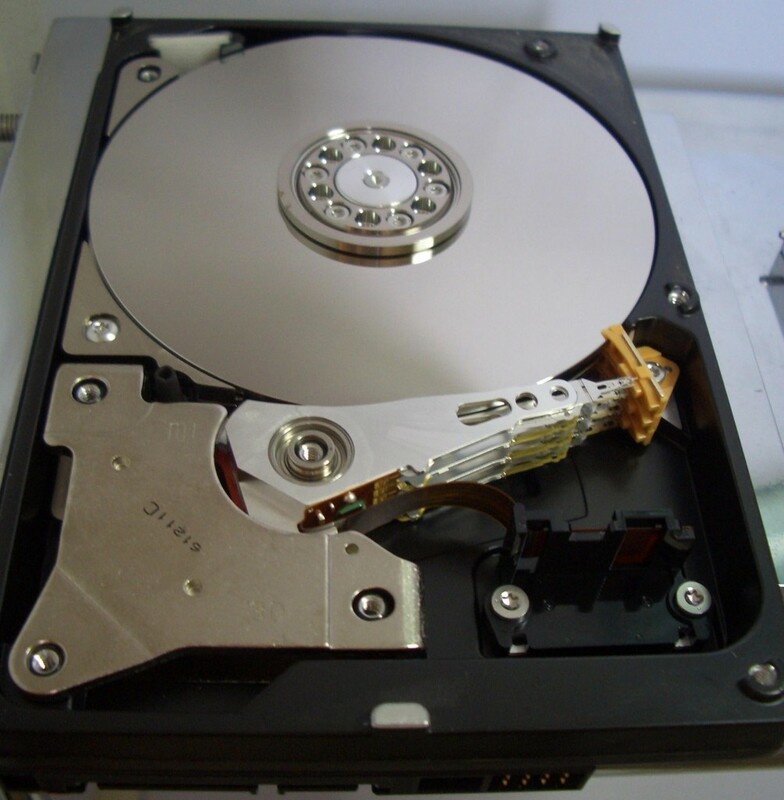 For this reason a hard drive dropped while it was in use generally has a considerably lower likelihood of successful data recovery than one which was switched off when the impact happened. What Happened To My External Hard Drive? Previous post: Should I Try Swapping the Printed Circuit Board on My Failed Hard Drive? Next post: Why Does My 1TB Hard Drive Offer only 931GB of Space? “Just wanted to thank you for what has been a great service. It was definitely worthwhile using your services to get back what everyone else was telling me was lost! Those photos and accounts are priceless”.